This 1886 cabinet photo of Jim Mutrie's NY Giants provides a window into the HOF heist. For the past few years we’ve been writing about the infamous thefts from the Baseball Hall of Fame on a regular basis as suspect items continue to appear in auctions and online sales. Letters addressed to August Herrmann and MLB officials have appeared and subsequently been withdrawn from sales at Robert Edward Auctions and Heritage Auction Galleries after being identified as having originated from the National Baseball Library’s Herrmann Papers archive. That being said, other Herrmann letters have appeared in Steve Verkman’s Clean Sweep Auctions and, although they’ve been identified as having been part of the same archive, they have been sold without the Hall of Fame claiming title to the documents. Last night auctioneer Huggins & Scott sold two more documents believed to have been stolen from the Herrmann archive written by HOFers Joe Tinker and Fred Clarke. Both of those letters were previously offered and withdrawn from a Heritage auction in April of 2010. The Hall of Fame’s Herrmann/Tinker file found in folder 40 of box 28 includes over 20 letters written by Tinker to Herrmann from 1920 to 1926. The Huggins & Scott Tinker letter is dated Sept. 3, 1924 and, like the letters still at the Hall, contains content related to the Reds spring training facility. As for Clarke’s letter to president Harry Pulliam regarding the protested game, Box 44 of the Hall’s Herrmann archive includes an entire file dedicated to this specific game. It appears that despite the withdrawal of the letters from Heritage, the Hall of Fame never recovered the documents or claimed title despite the overwhelming evidence that the documents appeared to originate from its Herrmann treasure trove. Despite the fact that Verkman and the consignors cannot present verifiable provenance for the offered documents, the auctioneer feels justified in selling off the suspected contraband since the Hall of Fame did not pursue recovery or attempt to thwart the sale. To the contrary, Verkman has said that Hall spokesperson, Brad Horn, told him the museum could not definitively say that the documents he was selling were stolen from Cooperstown. Horn has never publicly confirmed that he made that statement to Verkman. This week Verkman sold off another letter to Herrmann from Boston Braves owner Emil Fuchs. The letter sold for $138 and Verkman’s commission was roughly $50 bucks. The letters Verkman has sold have not been very valuable, a few hundred dollars each, but other items sold by his competitors have. Huggins & Scott sold the Clarke letter for only $475 and the Tinker letter for $1,100. In 1999, another suspect Clarke protest letter sold for $3,162 at Sotheby’s and in 2008 a 1948 Joe Tinker letter (also suspected stolen from the Hall) sold for $4,800 at Legendary. The poor showing for the two letters in the H&S sale suggest that savvy and informed collectors are avoiding purchasing documents believed to have been stolen from institutions. Haulsofshame.com learned about the sale of the Huggins & Scott letters last night and on short notice auction VP, Josh Wulkan, said he was unaware the letters were withdrawn from Heritage due to title issues. Said Wulkan, “This is the first I’m hearing of this. I can say we would not have offered these if we knew they were withdrawn from another auction with title issues.” Wulkan said he was unaware of the consignor ever informing the auction house of the previous withdrawal from Heritage. The Hall has had a tougher time denying that thefts occurred when it comes to rare photographs considering several examples of images that have been sold bore marks and identifications that clearly identified the items as Hall of Fame property and were stolen from the institution. 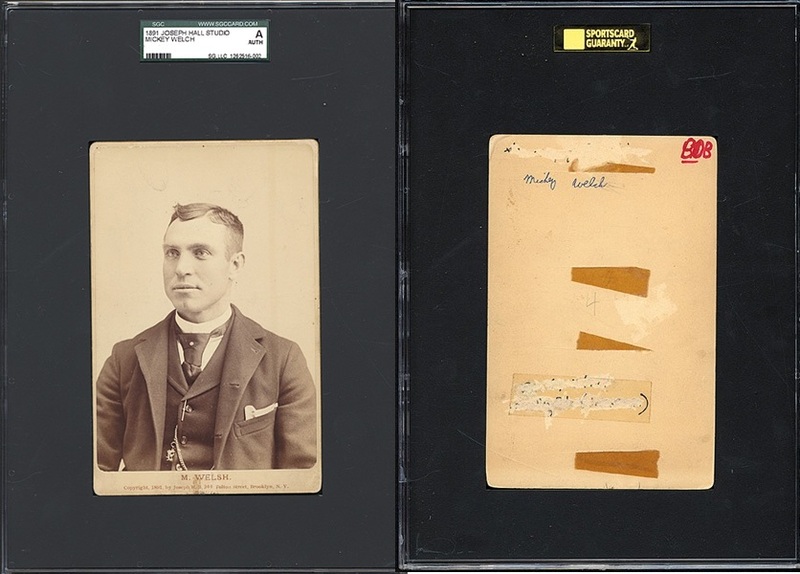 A Horner cabinet photo of Nap Lajoie that once sold for over $17,000 at Mastro Auctions had a defaced library accession number and a “PD” mark on the reverse placed there originally by librarians. A Falk cabinet photo of Christy Mathewson also sold at Mastro for over $10,000 and featured the library accession number covered with white-out and the same “PD” mark as well. An ultra rare Joseph Hall cabinet photo of “Smilin” Mickey Welch, a Hall of Fame hurler for Jim Mutrie’s champion New York Giants of the 1880s, was withdrawn from a Robert Edward Auctions sale because it had the same Hall of Fame ownership marks on its reverse. Sources indicate that all three of these gems have since returned to Cooperstown. Mickey is finally “Smilin’”. This SGC-graded 1891 Jos. Hall cabinet photo of Smilin'Mickey Welch offered by REA in 2010 was stolen from the Hall of Fame as evidenced by the defaced accession number and "PD" mark that was altered to read "BOB." But it is another photograph also featuring the portrait of Smilin’ Mickey Welch and Jim Mutrie’s Giants that illustrates the lengths someone has gone to swipe history and the true magnitude of the Cooperstown heist that Haulsofshame.com estimates has totaled well over $1 million in losses of donated artifacts for the Hall. Back in 1984 SABR published a review of nineteenth-century baseball photography called The National Pastime and on page 52 featured an image of Jim Mutrie’s 1886 New York Giants Base Ball Club. The photograph was a composite of portraits of the Giants surrounding Mutrie and was created by the New York photographic studio of J. Wood. 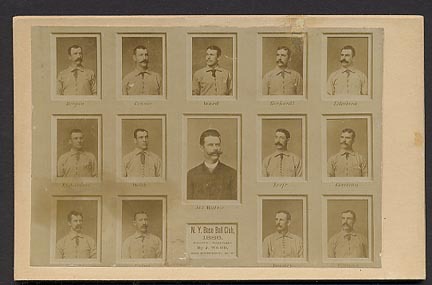 The image was clearly credited to the Hall of Fame with the designation “NBL” accompanying the image which was housed at the National Baseball Library. John Thorn and Mark Rucker edited the 1984 SABR photographic revue and conducted photo shoots at the Hall of Fame, New York Public Library and also at the homes of several collectors who were willing to contribute to the project, including Lew Lipset. The original black & white contact sheets for those photo shoots have survived and an examination of one particular Kodak sheet marked “HOF-9″ reveals the 1886 photograph used on page 52 of the SABR review. 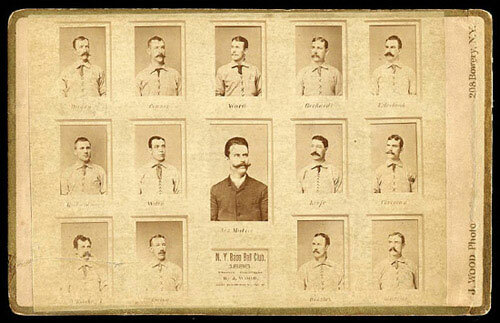 This is the 1886 cabinet as it appeared on the B&W Kodak contact sheet for the 1983 SABR photo shoot at the HOF. This image was cropped and appeared on page 52 of "The National Pastime." Lot 25. 1886 New York Giant Cabinet. Beautiful cabinet of a great team. Roger Connor, John Ward, Tim Keefe, Buck Ewing, Mickey Welch and James O’Rourke are among the 14 players. (……) The photo of Welch is the same one used in his Four base Hit. The photos can also be seen on other 19th Century cards including G & B’s and Yum-Yums. The only fault in the card’s condition is a scrape at the upper right of the picture of Gerhardt. This has been hand drawn in to try and give its original appearance. Otherwise a couple of 1/4” wrinkles. Still excellent. Then, in 2006, Heritage Auction Galleries, of Dallas, Texas, sold the exact same cabinet card again for over $10,000 and this time included a higher resolution image of the albumen print and mount and the reverse of the card. 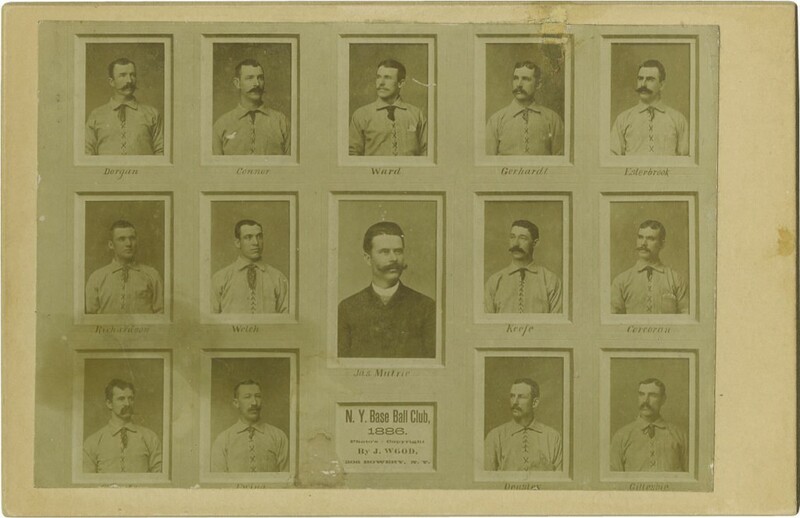 The Heritage lot description said: 1886 New York Giants Cabinet Photograph by J. Wood, Type 1.No other cabinet photograph on earth could possibly offer more nineteenth century Hall of Famers than does this remarkable artifact from the studio of noted lensman J. Wood. 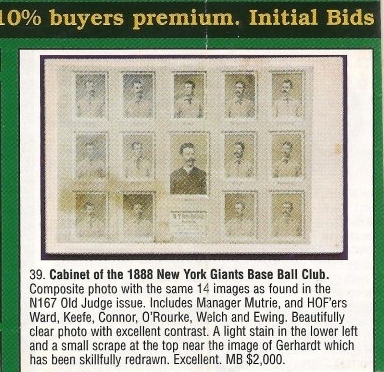 Fourteen stunning portraits, many used in the monumentally scarce and valuable 1888 E223 G&B Chewing Gum issue, are utilized in the design paying tribute to the New York Giants in their fourth year of existence. Enshrined at Cooperstown, and present upon this cabinet, are Roger Connor, John Montgomery Ward, Mickey Welch, Tim Keefe, Jim O’Rourke and William “Buck” Ewing. Some scattered staining at lower left and a bit of wear at the top border just right of center must be noted, but our catalog imagery should accurately express just how minor those considerations are, and how little they affect the dramatic visual appeal. You’ll very seldom find cabinet photographs that celebrate twelve decades of life in such fine shape, and fewer than ten examples of this particular piece are known to exist in the hobby. Mount is blank and very clean, and likely dates from a later period than the original image. Size is 4.25×6.5″. 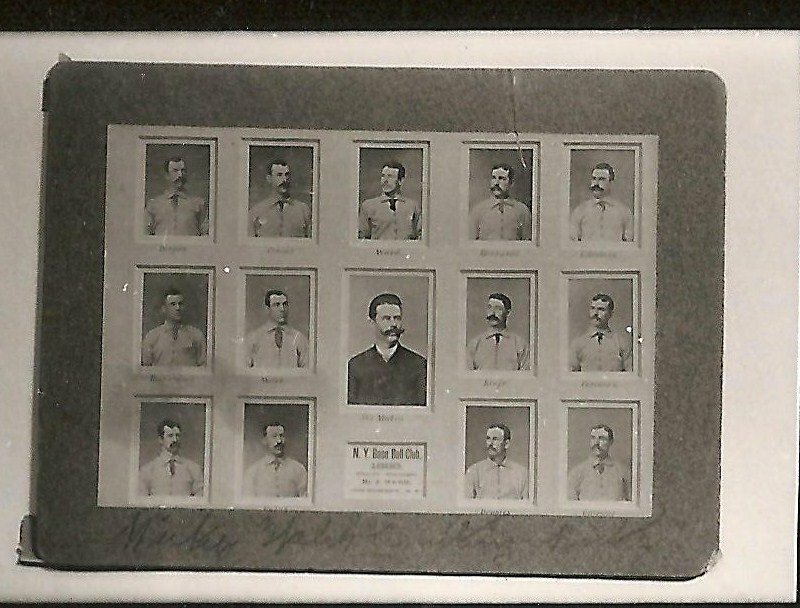 It appears that the albumen print affixed to the grey board with the Mickey Welch identification that was photographed at the Hall in 1983 is, in fact, the same Heritage albumen image that appears on a different generic cabinet card mount with a blank back. The staining in the lower left corner and the evidence of the original tear above player Gerhardt’s head are seemingly identical (as are numerous other blemishes and imperfections on the portraits of players Connor, Ward and O’Rourke.) Someone removed the albumen print from the original grey mount with a larger border and reapplied it to a generic mount. Heritage even notes that the board the photo is mounted on “likely dates from a later period than the original image.” Other surviving cabinets similar to this one produced by Wood have the photographer identified on the front with the pre-printed and gilded graphics “J. Wood Photo 208 Bowery, NY”. This J. Wood cabinet on a period mount produced by the photographer appeared in a 2007 REA auction. The "J. Wood" identification appears in gold on the front of the cabinet. The reverse of the card is blank. The mystery that remains unanswered is who sold the cabinet to Lipset (or anyone else) after the 1983 SABR photo shoot at the Hall of Fame? Perhaps the greatest irony of this situation is that the original mount that the photo was affixed to at the Hall photo shoot appears to bear the original and rare signature of Mickey Welch. The photograph was likely donated by Welch’s family and the Hall of Famer likely wrote his name on the mount to identify that his portrait was featured on the composite photo. A signed photograph of Welch, to date unknown to exist, could be worth as much as $50,000. The inscription on the bottom portion of the mounted cabinet photographed at the Hall in 1983 appears to be executed in the same hand. Although the identification appears extremely light and is obscured by the dark cardboard mount, Welch’s distinctive letter construction and formation is evident in the handwritten inscription. So, where is the original mount featuring the scribbling of “Smilin’ Mickey”? Did the thief save it or destroy it? Yet more mysteries that may never be solved. 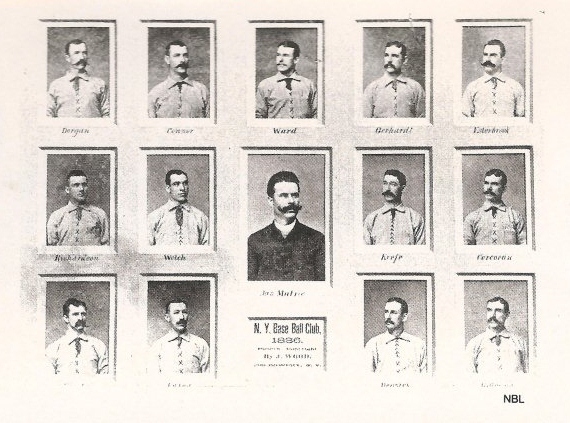 It is not a mystery now, however, that the National Baseball Library was actually robbed of its 1886 cabinet of Jim Mutrie’s Giants. We informed Hall of Fame spokesperson, Brad Horn, of the evidence of the theft and sent him the contact sheet image of the photograph before it was stolen and asked him for a statement from the institution. We also asked if the Hall would report the theft to the Cooperstown Police Department or the New York State Police. Horn did not respond to our inquiry. Chris Ivy, Director of Sports Auctions for Heritage, was contacted to inform the auction house of the stolen item but he was out of the office and unavailable for comment. Ivy’s director of consignments, Mike Gutierrez, was the prime suspect in an FBI investigation into the Hall of Fame thefts in the late 1980s. However, the Hall of Fame, the US Attorney’s office and New York State prosecutors never charged anyone in connection with the heist that has cost the museum and library more than a million dollars in lost baseball treasures. It just goes to show you how stupid these thieves are,they steal a hot item,put it on E-bay or give it to a auction house to sell and when it is determined it is either forged or stolen, it is traced right back to where it came from and bingo they are busted.When brains were given out, these jerks sure were over looked and are just deserving to whatever happens to them. Astounding that evidence against the suspected thief was never pursued. Lets face it, the HOF is covering up a awful lot that they dont want John Q to know about, cause they want to keep their sqeeky clean image so John Q will continue to patronize thier door step and think they are the best since sliced bread, when as time goes by, it is proven different. Is it HOF or ATL? ?